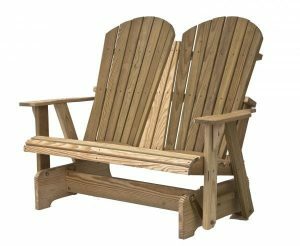 Wood Outdoor Furniture | Amish Originals Furniture Co. If you’re looking for stylish furniture for your porch garden or patio Amish Originals has you covered. Our wood outdoor furniture is built not only to look beautiful but also to last. Created by local Amish craftsmen to stand up through all sorts of weather, our wood outdoor furniture will look great for years to come. Amish Originals works with over seventy local Amish woodworkers to bring you the highest quality and most beautiful wood outdoor furniture we possibly can. Handmade in small workshops and family barns, Amish Originals’ wood outdoor furniture is like no other. It is beautiful and unique giving you a conversation piece as well as an ability to enjoy your yard. Looking for that perfect porch swing for your front? Trying to find the perfect glider and foot rest so you can enjoy the sunset from your patio? Or maybe you’re looking for something simple so people can have a place to sit when you host your barbecues. No matter what type of wood outdoor furniture you’re looking for, Amish Originals has what you need. From Gliders to traditional rockers, tables to foot rests, single or double seating, Amish Originals wants to make sure you get the wood outdoor furniture you need to make that outdoor space feel like an extension of your home. At Amish Originals we are ready to help you find exactly what you’re looking for. The best way to pick your wood outdoor furniture is to visit our Westerville, Ohio showroom. If you can’t make the trip, our online catalog is the next best thing. Don’t see what you’re looking for? No problem! Contact us directly and we’ll help you out in any way we can so contact us today!